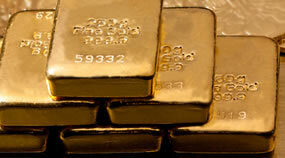 Precious metals futures kicked off the new trading week on Monday with modest losses. Gold and silver posted their third straight session declines with the former ending near a two-week low. Gold for August delivery dipped $2, or about 0.2%, to settle at $1,297.30 an ounce on the Comex division of the New York Mercantile Exchange. The close is the lowest since May 23. "Early gains in the safe-haven metal were lost when the U.S. dollar index rebounded from solid losses overnight and was trading just slightly lower at midday today," Jim Wyckoff, a senior analyst at Kitco Metals Inc., said in a report. Gold futures ranged from a low of $1,293.80 to a high of $1,302.30. They slipped 0.3% last week. Silver for July delivery dropped a penny, or less than 0.1%, to settle at $16.431 an ounce. Silver futures traded between $16.38 and $16.56. They dipped 0.6% last week. July platinum fell $3.20, or 0.4%, to $903.50 an ounce, ranging from $900 to $911. Palladium for September delivery lost $2.30, or 0.2%, to $994.30 an ounce, trading between $988.50 and $1,004.40. The two metals logged gains last week — 0.6% for platinum and 2% for palladium. Last week in LBMA results, palladium climbed 1.3% while the others recorded declines reaching 0.7% for fold, 1.5% for silver, and 0.6% for platinum. United States Mint bullion coins logged their first sales gains of the month on Monday. Advances included 50,000 in American Silver Eagles and 5,000 in American Gold Buffalos.